Sometimes I do things and I'm not sure if it will be a success or a fail. The other day was one of those days. I had my friend, Dana, and my sister in law, Beth over with their littlest ones. Too cool for the water table, too many little pieces for my nephew, Mason and not much I could think of doing. It was, however, perfect outside weather. So what did I decide? I had boxes of baking soda in my refrigerators that needed to be changed, a boat load of vinegar and a bunch of empty spray bottles. My experiment formed. We gave the two year olds full boxes of baking soda to dump on the patio. 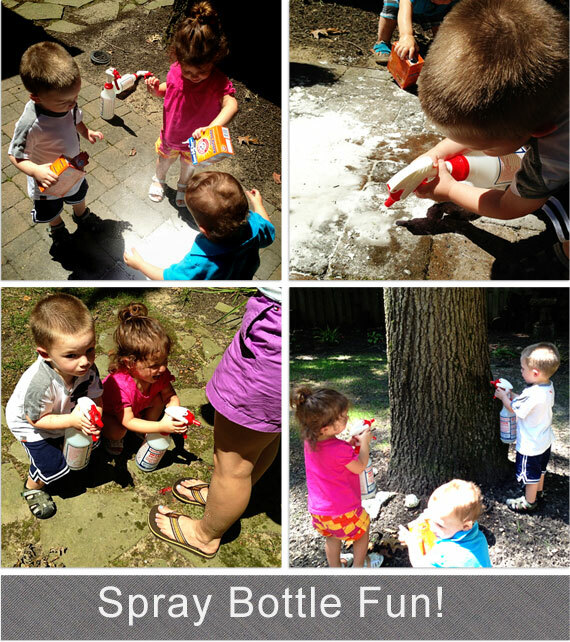 We gave them spray bottles filled with vinegar and told them to spray the baking soda. They went to work! It bubbled and fizzed. They only sort of notice. They did, however, LOVE spraying! When my feet started to smell like vinegar from all the missed shots I finally gave them spray bottles filled with water and the went to town watering everything. Plants, trees, feet. While my original plan was lost on the one to two year olds they really did have fun! Turns out all they need is some spray bottles and a target!